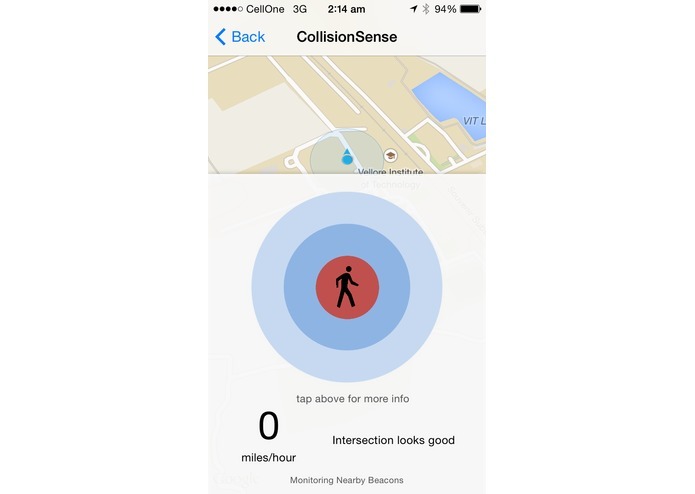 Smart Traffic Collision Avoidance System using Bluetooth Low Energy Beacons. 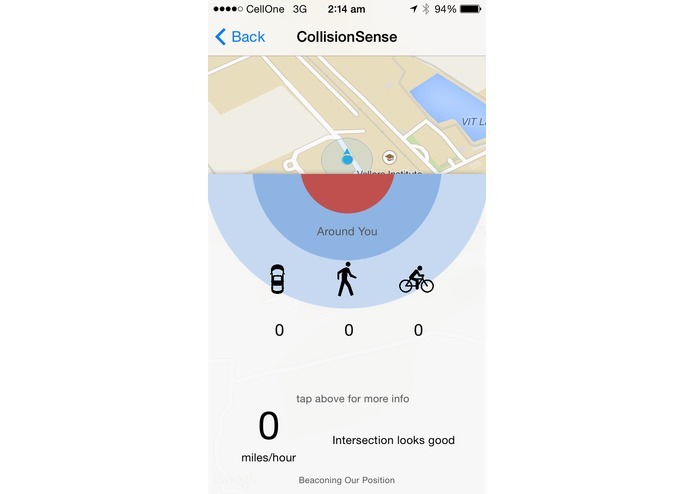 CollisionSense is an elegant solution to today's problems involving accidents that occur at intersections in the city. Given the scale of the issue we wanted to come up with a solution does not require any setup or initial investment. We wanted to deploy a system that could leverage existing hardware and software and can start operating from the get go. The technologies primarily leveraged by our app are Bluetooth Low Energy (iBeacons) and GPS. 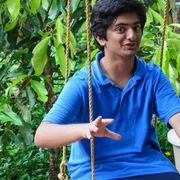 The reason for having such a simplified stack is motivated by our goal to maximize the user base for this system, so a large number of people can benefit from it, and the fact the we wanted to avoid any hard setup, or initial investment. The system works by creating a cluster of beacons at an intersection. This mesh is used by each individual device to position itself relative to other vehicles and pedestrians. Using this information we are able to warn users when another entity approaches a dangerously close distance. We can track and monitor multiple vehicles/pedestrians at a time and keep the user informed about the current scenario around them. 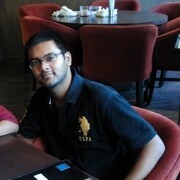 The App starts with a screen checking access to the permissions required by the app. It also requires Bluetooth to be ON at all times. Once you Tap Continue, you're taken to the integrated main screen of the App. On the top, you have the map, updating real-time with your location and heading. Right below that, you have what we call our Beacon Radar. This is the heart of our application as it provides real-time information regarding all the vehicles and pedestrians that are in your vicinity. Upon tapping the radar we show you the classification of users that are around you based on their mode of transport (Cycling, Walking or Driving). The icon in the center automatically shows your current mode of transport, by tapping into your iPhone's motion processor. Finally, at the bottom of the screen we show you your speed of travel and a statement describing the current scenario around the intersection. The map obtained is provided by Google Maps. The map continuously tracks the location of the user along with heading and distance. The map also shows real-time traffic data provided by Google. The beacon radar contains an icon representing the user in his/her current mode of transportation in the center and concentric circles around this icon. The largest circle shows the number of beacons that are at a significant distance from the user. These could be cyclists, pedestrians or car drivers. The inner circle shows the beacons that are currently near the user. This would show cars that might have halted right next to the user's car. The innermost circle is reserved for emergency situations where a car/cyclist/pedestrian is dangerously close to the user. When this happens the inner circle starts to pulsate rapidly and a voice warning is initiated to grab the user's attention. The beacons' distances from the user are figured out by a complex algorithm involving the measuring of the strength of the signal from every beacon. The user's phone is performing 2 roles. It broadcasts itself as a beacon and scans for beacons around the user. It performs both of these tasks in quick succession so as to provide the users with the most up to date status of the intersection. Each beacon broadcast differently based on the mode of transport in use by that particular user. Hence our app is able to classify all the signals reaching it and show the user a consolidated view of users of the different modes of transport in his/her vicinity. This data can be viewed by tapping on the radar view, and can be dismissed by tapping again. This is the bottom most section of the display. It shows the real-time speed of the user obtained via GPS. It also briefly describes the current situation in the intersection in an easily glance-able sentence. 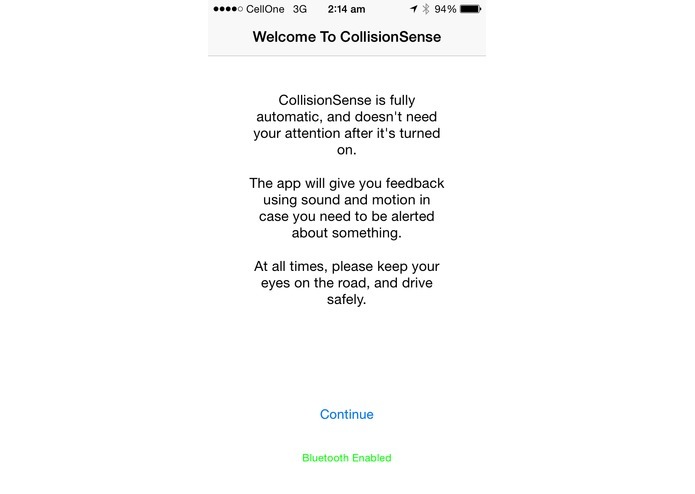 It is important to note that CollisionSense seamlessly switches from one intersection to another as the user travels as our app is continuously monitoring for beacons and hence possible collisions. The app does not transmit any user specific data from device to device. All data transmitted is a generic and only relates to the app. No user can be uniquely identified by the data transmitted. This whole can be EASILY ported to Android, as Android has full support for BLE (as of Android 4.3) and full third-part support for iOS Beacons.